Nyquist’s words don’t quite match the on-ice optics. Spurgeon gave Nyquist a cross check to the back. When Nyquist got up he looks right at Spurgeon and slashes him in the face. That looks awfully intentional. Based on how he looks directly at Spurgeon before swinging his stick and the way the blade is turned, it might be hard to argue to the Department of Player Safety that it was an accident. In fact, it’s obvious to the extent that it’s perplexing he wasn’t given more than a double minor in the game (Spurgeon required stitches). It’s a dangerous play. As Spurgeon noted after the game, he’s lucky Nyquist wasn’t an inch or so higher because that could have done serious damage to the defenseman’s eye. The Kings have placed winger Devin Setoguchi on waivers. After spending a season in Europe, Setoguchi got a professional tryout to head to training camp with the Kings. He earned a one-year contract carrying a $575,000 value. Although things started that way, the season hasn’t been a storybook ending for Setoguchi. Through 45 games, he’s put up four goals and 12 points for the goal-starved Kings. Times have been even tougher recently. He’s been held without a goal in 18 straight games and has just four assists in that stretch. During that time his ice time has largely hovered around 10 or 11 a game. 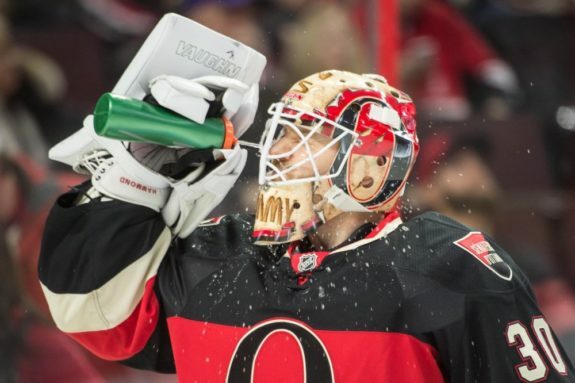 Not far removed from a big contract extension that allowed the Senators to trade Robin Lehner away, Andrew Hammond has struggled. It got to the point that the Senators waived Hammond Saturday (his birthday!). Sunday, he cleared unclaimed and was assigned to the AHL. The move was spurred by the return of starting netminder Craig Anderson, who posted a shutout in his first game following a leave of absence to be with his wife. The team has given the backup job that was once firmly Hammond’s to Mike Condon, leaving Hammond flapping in the wind. Hammond and his $1.35 million cap hit are on contract through next season. That extra year and the fact that his actual salary is $1.5 million next season may have made some teams hesitate at claiming him. He’s appeared in just six games this season with an .837 save percentage. The Minnesota Wild, already down Jonas Brodin, played without young defender Matt Dumba on Sunday. The Star Tribune’s Michael Russo reports that Dumba is considered day-to-day and he’s not expected to skate for the next few days. Dumba is out with a lower-body injury after getting banged up against the Lightning on Friday. He took a hit from Ondrej Palat that saw him slide awkwardly into the boards leg first. With the team trying to figure out what they have down the depth chart, there will likely continue to be an audition for rookie Gustav Olofsson. – In case you missed this one, Jonathan Drouin put on a clinic Saturday. – With the NBA telling teams that they have to play nice with each other on Twitter, the Predators and the Stars prepped for Sunday’s contest by poking fun at the league’s rule. we hope we win and you lose. because this is sports.